Sometimes cold pumpkin pie straight out of the fridge the day after Thanksgiving tastes even better than it did the day before. The sweetness is cut by the chill, and the custard is almost creamier than every after setting in the cold overnight. Why not get the same effects by making a pumpkin cheesecake instead? This cheesecake is tall and impressive enough with its striking orange hue to be the centerpiece of any dessert table, and it's not overly complicated to make. Since it needs at least 12 hours in the fridge before serving, it's a true make-ahead dish. A blend of classic pumpkin pie spices give it that familiar autumnal warmth, but the use of goat cheese as well as cream cheese adds a depth to the overall flavor, keeping you wanting for more after every bite. And a bonus - instead of spending hours preparing and chilling a flaky pie crust, you simply press buttered graham cracker crumbs into the pan! Adjust oven rack to lower third of the oven and heat to 450°F. Prepare an 8” x 3 3/4” round pan — it can be a springform pan or a cake pan. For a two-piece springform pan, wrap the bottom piece in foil before attaching sides and lightly butter. For a cake pan, line the bottom with a circle of parchment paper and lightly butter. To make the crust, stir the crumbs, butter, and salt together in a small bowl until evenly combined. Pour into pan and press into an even layer across the bottom. To make the cheesecake filling, place the cream cheese, goat cheese, rum, vanilla, and kosher salt in the bowl of a stand mixer with the paddle attachment fitter. Mix on low until cheeses are no longer chunky, then increase speed to medium and beat until smooth, about 5 minutes, stopping halfway through to scrape down the bowl and beater with a silicone spatula. Reduce speed to low and add sugar and spices and mix until evenly combined with the cheeses. Set a fine-mesh strainer over a medium bowl and crack the eggs into the sieve. Whisk with a small whisk or fork until most of the eggs pass through the sieve. Discard any clumps that remain. Pour the eggs into the bowl of the stand mixer and beat on medium low until evenly combined. Scrape down the bowl and paddle once again. Set mixer on low speed and add pumpkin to batter, mixing until evenly combined. Scrape down the sides of the bowl and beater once more time, also scraping the bottom of the bowl to make sure that no unmixed pockets of cream cheese are lurking there. Place the prepared pan on a baking sheet and pour the batter in, stopping once it reaches the very top of the pan. Bake about 20 minutes, rotating the pan halfway through, until the cheesecake puffs over the rim of the pan and becomes golden on top. Turn off oven and prop open the door a few inches to vent the heat for 10 minutes. 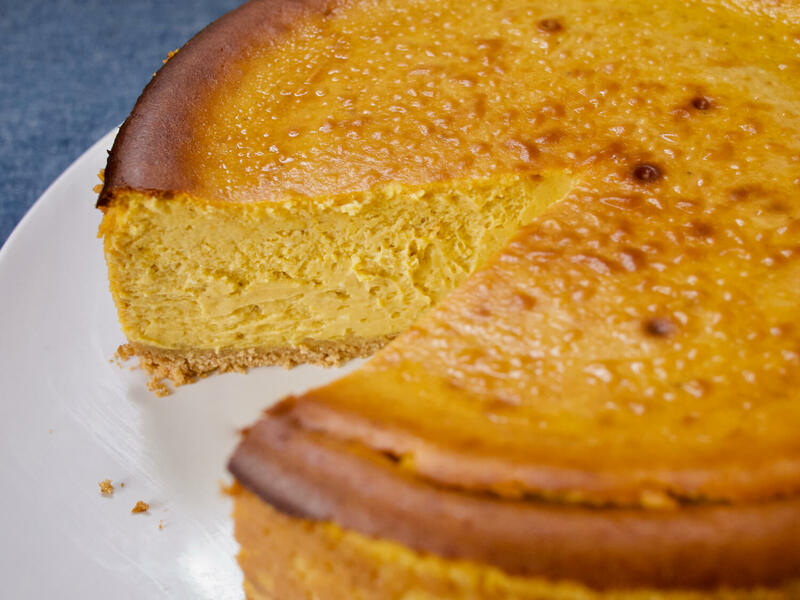 Set oven to 250°F, close door, and bake cheesecake until outer edges are firm and the very center reads 145°F on an instant-read thermometer, about 35 minutes more. Remove cheesecake from oven and cool on rack for 15 minutes. Run a thin knife around the sides to loosen the cake from the pan and then cool for one more hour. Cover and refrigerate until cold, at least 12 hours. To unmold the cheesecake, loosen the sides from the pan with a thin knife. For a two-piece pan, pop the latch and carefully remove the sides from the bottom. Invert onto a large plate and remove the metal bottom, then invert onto the serving plate of your choice. For a solid pan, fill a vessel wider than the pan with an inch or so of boiling hot water. Carefully place the pan in the water, making sure that it won’t touch the cake itself. Let stand for a few minutes, until the pan feels warm. Invert the cake onto a plate and gently and firmly remove the pan from the bottom of the cake. Invert onto a serving plate. To cut cleanly, rinse the blade until hot running water between slices. Leftovers will keep in the fridge, tightly wrapped in plastic, for up to 10 days. Serves 8-12. Adapted from BraveTart. Are you sick of pumpkin-flavored things yet? Yes? No? Either way, this tea cake is for you. Rather than the standard mix of spices that linger in the background and provide a general warmth to a pumpkin-flavored treat, this tea cake goes big and bold with the spices, incorporating a whopping 5 teaspoons of Vanns Ground Cinnamon, 2 tsp. What could make a well-spiced, perfectly moist, crunchily-topped pumpkin bread even better? Why cranberries, of course. It’s pumpkin muffin season! But these aren’t your typical giant, overly orange, super sweet cupcakes-masquerading-as-muffins -- these are the real deal. So, you’ve sampled every flavor of hummus available at the grocery store. Maybe you’ve even been making your own, and you’re ready for a change, a hummus that is the perfect balance between sweet and savory, and is spiced with a warm blend of flavors.